Thanks for supporting the blog! As a result, we’ll continue to add information as we meet more dealers and continue to visit these watch stores. The Rolex GMT Master ii “Batman” 116710 BLNR has now officially been discontinued. Prices are surging to $14k+ for the watch. Interestingly, the black ceramic Bezel 116710 has been discontinued with no replacement, and prices for those are surging to over $10k+ new. Keep in mind, the new 126710 Pepsi has the new 3285 movement. Jaden at JAG watch continues to have the strongest availability of the hardest to find Rolex sport watches. After a week of price checking, Jaden is still the cheapest we have found. We have never seen any store have more 116500LN Daytonas in stock in the world. He also has upgraded his storefront and has moved to 2nd floor, 36-44 Nathan Road, Nathan Road, Tsim Sha Tsui, Hong Kong. One thing we noticed is that Jaden has stopped selling as many used watches and is turning more into a source of new watches. Last time we went, out of the 100+ watches he had in stock, only 3 of them were used. His explanation was that since demand for Rolex’s are so high, people are not willing to trade in the watches as they used to, making used inventory in general, scarce. 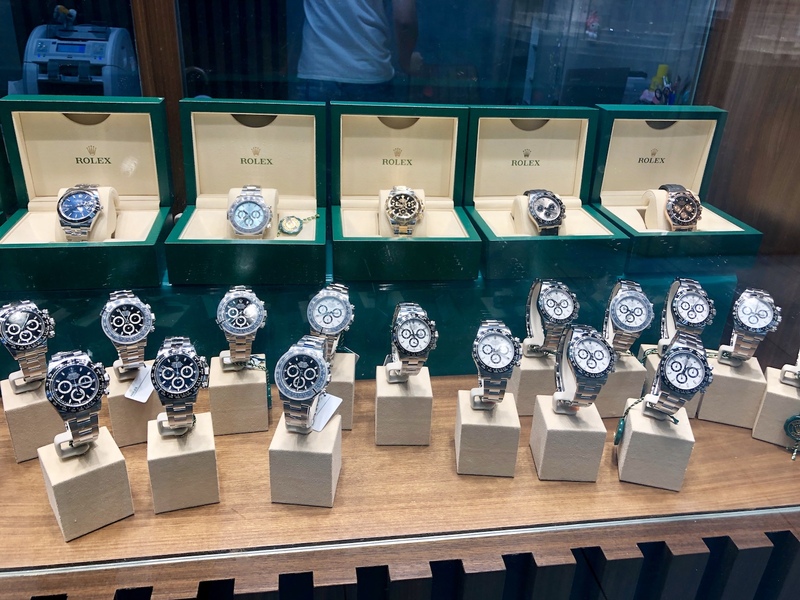 Engrained in Hong Kong’s culture is a love affair with luxury watches, especially Rolex Shopping in Hong Kong. Surprisingly, it has some of the highest per capita spending on luxury watches of any country in the world. Therefore, you can see a Rolex on the wrists of the gentleman coming out of a Rolls Royce, or the server at a local noodle shop. This phenomenon, along with the lack of sales tax makes it an amazing place for a foreigner to shop for a new or used luxury watch. 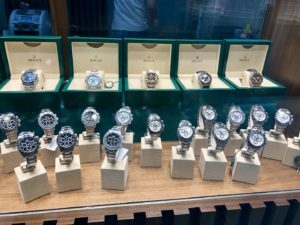 As a foreigner, there are still so many questions and concerns to be answered before actually purchasing a Rolex in Hong Kong. First of all, where to buy a luxury watch in Hong Kong? 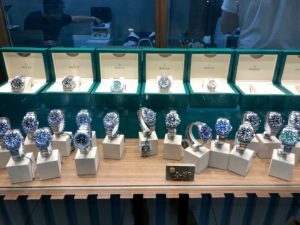 Should I buy a new or used luxury watch in Hong Kong? How do I know if the luxury watches in Hong Kong are new or fake? Everyone has a Rolex, do I really want one? As a result, this Hong Kong Rolex Shopping Guide is intended to help a watch novice navigate through these challenges. Ultimately, helping them get the luxury watch of their dreams, all at a great price. Hong Kong Rolex – New or Used? First of all, the question that gets asked is, should you get the watch new or used? If you search Google, for “where to buy Rolex in Hong Kong” or some similar permutation, you will see that there is no comprehensive guide. As a result, there are just people recommending certain shops. We spent 4 days straight going to over 50+ watch shops across Hong Kong to help educate potential buyers. Hong Kong Rolex-Where to Buy? Many readers ask me where would Team GTE go if they only had time to go to one place. We would say, go to TST (Chung King Express area) or Mongkok (Ying On building area). This is where the highest concentration of watch dealers both new and used are. To me, that’s a huge marketing scam and to illicit fear in buyers about buying from non-authorized dealers. They say nothing about the secondary market, and there are plenty of stores and watchmakers that have been trained in Switzerland that can care and know about the watches just as good as authorized dealers. This is all to keep the prices of the watches high and keep up with the business adage that “price signals quality”. Just as a reference, people were buying Rolex watches in the 60s for less than $1000 USD, back when the watches were actually professional tools. Low Risk – Your chance of getting a fake is pretty much zero. They only sell new watches and all purchases come with official Rolex Boxes and Papers. They are stamped from the exact authorized store that you purchased from. Inspection – What I like to use the AD shops for is to look 100% real Rolexes so I have a reference in terms of the look, feel, fit, finish, weight of the watches when going to the secondary markets and used stores. As long as you dress semi-respectably, the salespeople will have no problem showing you any watch you want to see, as they are used to many shoppers from Mainland China especially who just point, try on, and furiously buy everything in sight. Most of the sales people are just there to sell you the watch. They always tell you about the security about buying from an AD and how great of an investment a Rolex is. Unfortunately, just like a new car, the watch usually depreciates around 20% right out of the store. Price – The best you can get at stores like this is the 6-9% savings on sales tax and maybe an additional 2-5% off of the MSRP price. If you pay by cash or wire, you can save on the 2% credit card fee. If you bargain hard enough, you can get another 3% off. 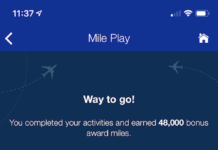 Selection – This one is a bit surprising for most people, but ADs don’t actually have the best variety. They, of course, will carry the popular ones, such as the Datejust, Submariner, or Daytona, but if you want ones that are less common such as a Yacht Master with the Dark Rhodium Dial or even a Sea Dweller, stores only have 1 or 2. Once they are sold, they won’t get another one until up to 1-2 months. Atmosphere – At these stores, I feel like they aren’t really watch guys. They are just sales people trying to sell a piece of jewelry. While they offer you hot tea and water, I just don’t feel like sitting around talking about watches with them. This category gets more interesting, as these stores are more scattered. 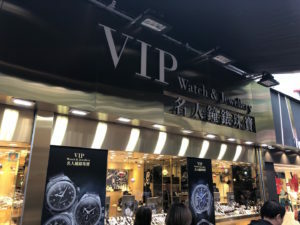 Couple examples such as VIP station on Hanoi Street in Tsim Tsai Tsui, has a huge storefront, with hundreds of Rolex (and others such Patek Philippe and Omega). In contrast, I went a bit farther out to North Point to some obscure Commercial Building to visit Tony at Moibitime. There, they had an amazing collection of Rolexes and other high-end watches(He’s big into Richard Mille watches). These stores specialize in new watches. They acquire them via multiple sources such as Authorized Dealers from all over the world, individuals, or trade shows. Every store has its connections to get these watches. Take VIP Station for example. All their watches are new, come with boxes and papers, but their papers can be from a store in HK, or even Dubai or Barcelona. They buy it off or ADs at almost wholesale so that the ADs can move more inventory quicker and also make a more consistent revenue stream. These guys seem to have a lot of connections. As a result, if you want a watch that they don’t have, they would make a couple of calls, and depending on the day of the week, can get you the watch delivered to the store within a couple of hours if you put down a deposit. Price – The standard price across all these types of stores is about 20% below MSRP if you pay in cash. If not, it is 2%+ more. There’s very little room to bargain but if you push hard enough or is a frequent enough client, you can squeeze a couple more percentage points off. Selection – These stores have an amazing selection of watches that are far larger than Authorized Dealers. They can also get you a watch a lot faster from their internal network faster than an AD trying to order directly from the manufacturer. Atmosphere – This can vary. A store with a retail front can still feel pushier, but at least they are more open to negotiating. They still try to hold their secrets and sources close to their chest. They also still use the fact that the watches being brand new as their biggest selling point. Increased Risk – These stores have a bit more risk than buying from an AD. 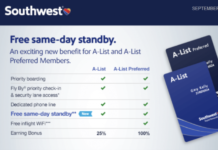 Depending on your risk tolerance, you can determine if the 15-20% discount is worth it. There is also a bit more risk in terms of bringing it back to your home country, as you are technically required to declare the purchase for customs and tax reasons. That is why many people wear their watches on the plane. If you do get searched on customs, you will need to explain why you have a matching box and papers for the exact watch you have on your risk. These shops were the most interesting to me because these shops were where I found not only the lowest prices but some very unique examples of Rolex watches. There is a heavy concentration of these types of shops in Mongkok (closer to the Yau Ma Tei Station side). They are located more in the working class areas of Hong Kong, which naturally has them catering more to the common man in Hong Kong. If you compare across the stores, all the stores are pretty much the same, as all the watches are in excellent condition. I didn’t see one store where they sold a watch that was beat up that you need to refinish yourself. I think culturally, Asian people like things as new as possible so there is less of a market there for those bare bottom bargains. The only differences would be if they have the papers and original box or not. If they don’t, you can get about an additional 15-20% discount below the used rate. There were also an abundance of gold watches and watches with jewels in there. 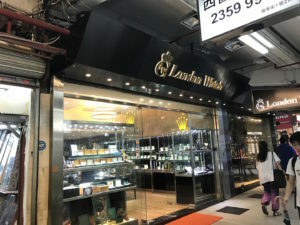 One of the owners explained to me that Hong Kong people think of everything as an investment, so they think owning precious metals and jewels on their wrist as a form of investment. Another key thing that I learned is how business and communication is done with these shops. Most don’t have fully built out websites with up to date inventory, don’t really respond to email, but do most of their communication on Facebook / Instagram and WhatsApp. Once you get connected with them they are very quick on responding and these guys can source you pretty much any watch you want. Since you are dealing with mostly used inventory, the chances of getting a fake or something that is tampered is higher. This is of course if you are unaware of what you are looking for. The good thing is, most of these watch dealers are located in respective locations (not selling the watches off a table in the street alley). 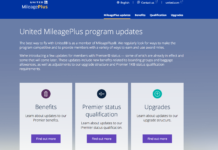 Most importantly, they openly welcome credit cards (they charge a standard 2% fees). This is a key point because then your purchase will be covered for fraud from your credit company and since a credit card company always sides with the consumer, can easily do a chargeback to the original vendor. This definitely incentivizes the sellers to only sell high-quality products. I would recommend that you NEVER buy from a shop that is 100% cash only. For most people, it will still be worth it for them to buy it used and then get it checked out a local watch shop for authenticity to have the piece of mind. A local expert can do a full examination, open up the watch, and weigh everything from the links to the screws to tell you if anything has been tampered with. This was the first store is the one that I saw a lot of people on the Rolex forums asking about it. Friendly staff, limited selection, and to be honest wasn’t that great. To my disappointment, there wasn’t anything really special about the store. They were the heaviest marketed and forum discussed watch store that I visited (they have 4 branches in Hong Kong). Surprisingly, this was hands down the most impressive store that I went to. It was equivalent to a Rolex Museum. They specialize in vintage Rolexes and had everything from the original chronographs, Milgauss, Submariner Comex, Tropical Dial GMT Masters, and custom made watches for Dubai royalty. They have bookshelves full of Rolex books and their watch repair/tool bench was exposed right in the back section of the store. The staff was super friendly and spent an hour walking me through the history of each of the watches, the only problem was that most of these watches start at $50,000+ so it was a bit out of my price range. They had a smaller inventory of newer watches at fair prices but it’s their vintage selection that sets them apart. Definitely recommend following them on Facebook / Instagram, where apparently they do most of their business. Jaden used to be the sales manager at TimeZone (see below) and started his own shop in September of 2017. He currently specializes in new modern Rolex watches but can also source you a used modern watch (along with APs and Pateks), as Jaden has a very strong network of suppliers. Price – Lowest price out of any watch store I have been to in Hong Kong. How does he do it? Jaden focuses on pushing volume instead of trying to make the most margin per watch sold. 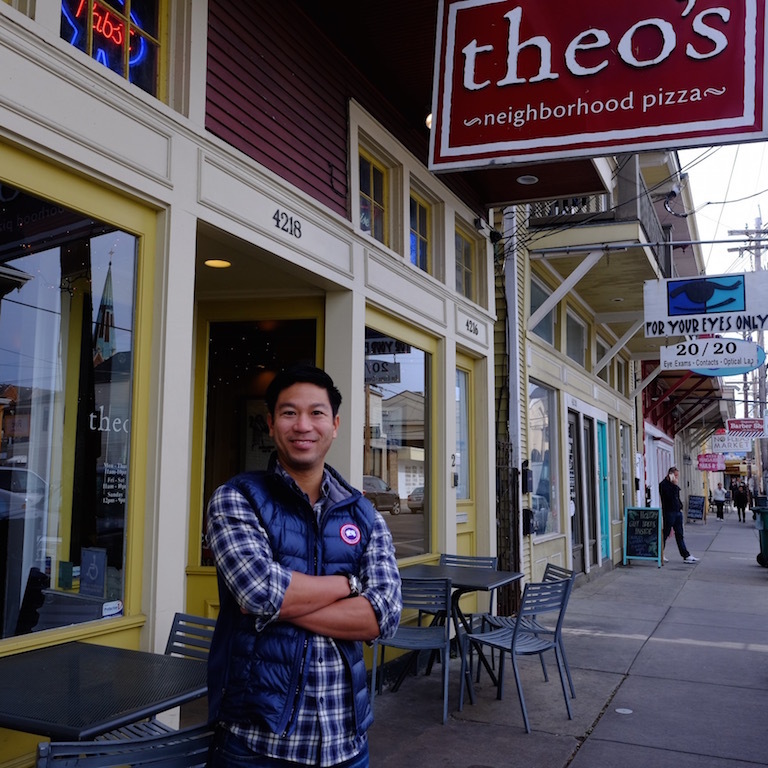 His extensive network and sourcing skills allow him to restock his inventory quicker than his competitors. Payment Methods – Cash (cheapest method), credit card, and wire transfer(in USD) are all available. Service – Jaden is one of the friendliest watch dealers I’ve met around the world. As a result, feel free to ask him anything about watches, the market, etc and he’ll gladly give you his honest opinion. Small Shop – Don’t be alarmed by the small size of the shop. It’s best to contact Jaden via WhatsApp or Facebook beforehand to make sure you get the watch that you want. The savings on retail space is passed directly to the consumer. Just stopping by the shop could be disappointing, unless you want a Daytona! Location – Also, don’t be alarmed by the location. It’s located in the in the Chung King Express section of the Chung King Mansion(not in the actual Chung King Mansion where all the seedy activity used to take place). Take the elevators up and you will see a Pharmacy to the left and Cafe De Coral to the right. Section AB will be straight ahead. Remember, ALL legitimate watch stores will be in well lit, clean, and organized retails spaces. Limited Used Inventory – We have noticed that JAG watches as decreased used inventory , especially for the watches in high demand (Daytonas, GMTs, Submariners). The reason for this is that people are not selling back to trading Rolex watches as much as they used to because the value keeps on rising. The good new is, if you have one of the coveted time pieces, you can easily trade it in for top value! Selection – Best overall selection of mid-tier vintage Rolex watches (i.e. Ref 1675 GMT Master, 1680/16800 Submariners) and modern used Rolexes. He specializes in excellent condition full set (box/papers) watches with only very light polishing done to them. Service – Alex is friends with Jaden so they are in the same network, so both are very friendly. Location wise, they are located in opposite sides of Hong Kong so depending on where you are and your availability, it might be worth stopping by. Internet Presence – He has a fully built out website is has been a seller on Chrono 24 for many years, so it’s quite easy to view his selection instead of having to contact him first. 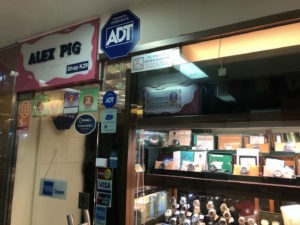 Name – Don’t be alarmed by the interesting name of his store, as the word “Pig” is a play on his last name “Chu”. Consequently, it sounds very similar to the word “Ju,” which means pig and his nickname. Location – Also, don’t be alarmed by the location. It’s located in a retail space called Manly Plaza in Querry Bay. First, go down the stairs and his store will be a couple of sections straight and to the right in section “K”. Remember, ALL legitimate watch stores will be in well lit, clean, and organized retails spaces. Update: Unfortunately, this stored closed down in December 2018. There are many other similar shops in the area but Ben was one of the friendlier people that we met. He’s still in the business and can be a resource for watches as he moves into his next watch gig. This small shop has a great selection and runs a simple business of having the fairest market prices on their watches. The staff (Ben) is very nice and knowledgable of their watches and watches in general. Their watch inventory consists of brand new watches, used watches with boxes and papers, to used watches with no boxes and papers. They offered no hassle pricing and gave me honest answers to everything I asked. They are also very good at sourcing you the exact watch that you want. If you tell them the exact model, they can source it for you in a matter of days. Additionally, they are very responsive on Whatsapp and Facebook. Price – This is where you can get the some of the cheapest used Rolex watches, which is their core business. Also, the prices are the most liquid as the secondary markets prices fluctuate quickly based on demand. Atmosphere – Interestingly enough, these are the type of stores where you can find real “watch guys.” And can have a conversation more than just about the price. People like Ben at Timezone walked me through the different sources where he picks these watches from, what dealer prices are, and whether or not specific watches are overvalued right now. In conclusion, there’s no way that one type of store would work for every single person reading this article. Everyone has different time constraints, risk tolerances, and budgets. But, what I took away from this experience is that watch buying is a relationship business. Most people buy and sell lots of watches through the same dealer that’s how these guys make a living. Overall margins, especially on the used watch side, are quite low. As a result, I encourage you to walk into these shops, have a conversation with these sellers. You will see that many of them are just as enthusiastic and love watches as you do. Many are willing to spend their time to answer any of your questions and educate you. You don’t even need to buy anything during your visit. In conclusion, feel free to message me if you have any questions. Furthermore, I hope you get the watch of your dreams. Hi, Good post! A question; VIP station/VIP watch & Jewellery seems like a big and serious GMD, but do you know why I just find can find info about them here and not on any forums? I see that they are active on Chrono24 as well, but no info on forums about them. Mentioned in few forum threads from 2010, but then as VIP station. Are they legit? I was thinking the same when I couldn’t find anything on VIP station online, but honestly I think it’s the way they do business in Hong Kong. It’s a lot of word of mouth, through Facebook, WhatsApp. Their selection is massive though. I consider the like a GMD “Boutique”, based on the inventory of watches they carry at all times, the large store front, but their prices are still about 10%+ higher than some of the smaller stores. Let me know if you have any other questions and happy hunting! I take it the only way to get your name on the warranty card is to buy via an AD? They aren’t required to put your name on the warranty card, but if you are concerned about that then buying from the AD is your best bet. Here’s how I see it, the discount you get up front will cover any work that may need done on the watch. The watches are very well built, as Rolex now has moved their service intervals to every 10 years for average wear, so in most cases, you won’t be needing the warranty. Also, there are many highly reputable independent watch repair shops that can service your watches for much less and also quicker. Message me if you have anymore questions, and happy hunting! Read your blog and I am interested in getting a rolex from Hong Kong. Btw, Have you ever heard before this Montrez shop in hong kong ? Do they sell legitimate rolex watches? I saw that they have a variety of rolex models. Thank you Theo, very solid contribution. Are the prices for new/unworn or pre-owned mint condition? If you referring to the 116500 and 126710, those are for new/unworn. To be honest, the used ones are all pretty much brand new right now and the price is very close to new. Great Post!, great comments from others, and very useful for my next trip to HK. Thanks again! First day in Hongkong, was searching for a rolex explorer. Used old or the new model. I pay full cash, which store do you recommend the mostly? Depending on which model you want. if you want the newer model (216570) check with Jaden at Jag watch as his price is the lowest, but may not have it in stock. He should be able to get it in a couple of days if you are staying for a while. If you want a used or 16750 white or black face, try going to Alex Pig (https://alexpig.com/collections/watches) or Ben at Time Zone. The price should be around $4500-6000 depending on condition / box / papers etc. You will save the 3% on cash payment too. Let me know if you have any other questions. Happy Hunting! Hi I am looking for a place to buy a brand new female datejust watch. Meant for mother. Is 31 a good size? Also, I am not particular about specific model, just need it to be half gold (or rose gold) and the interior with diamond pointers and preferably mother of pearl face. Where should I go to buy it brand new and also should I choose the models base on discount? thank you. I actually just visited his store 2 days ago and he continues to have the best prices and can source you almost any new watch you want in a matter of days. Usually the discount from MSRP is around 5-8% if you are paying by cash. He can also source you a used one also if you give him enough time. If you are looking for a used one immediately, you should have the model numbers handy as you will need to hunt for it. I would say the Mongkok area has the highest concentration of used watch dealers and will have to go store to store and find the exactly watch / condition you desire. 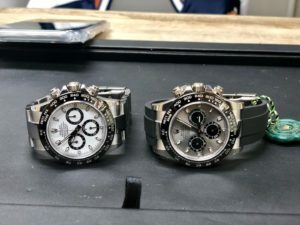 I am looking to buy daytona ceramic with the white dial ( panda). 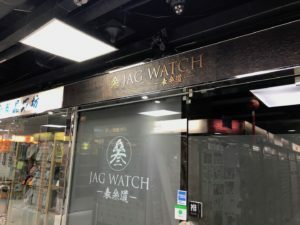 Do you know when JagWatch will reopen after chinese new year? Also, do you know the price list for that reference and is it possible to negotiate few % ? I just came back from Hong Kong last week and the pictures posted was the stock that Jaden had in his front display. Usually these places are closed for the whole week of CNY but feel free to message Jaden on WhatsApp as he’s always very responsive to my questions. Best to message him earlier in case you wanted to get a used 116500 Daytona (although the used prices are only a bit lower than a new one). Regarding the prices, they are changing very fast but if I remember correctly, current prices are around the 200-201k HKD range. Jaden’s price should be the lowest one you can find (I price check every time I go buy a watch from him), so the only real discount rate would be if you pay cash / wire vs credit card, in which you will save 2-3%. The nice thing is there are a bunch of shops in the same area and you can go price check yourself around the same mall. It’s part of the fun to visit a bunch of different shop. If you find cheaper, let me know so we can educate the community. Enjoy! Heading to HK this week and looking for a sub or deepsea new or used. First time buying; would you recommend JAG? Yes I would reach out to Jaden via whatsapp to make sure he has the watch for you. You can also use the price that he quotes you as a starting point, but from my visit last week, he is the cheapest as long as he has what you are looking for. I’ve been searching and studying up on some vintage Rolexes. Currently looking at the 1675 GMT Pepsi. Where you you recommend to buy from to guarantee quality. also not sure if I should spend the extra money to get one with papers and box etc. 1675 is highly desirable right now and the price varies significantly based on condition and if it is a full set or not. Full sets mint condition 1675 are $20k+ these days. I would say if you are going to wear it, you should just get one without papers (or even without the original band). Those will be the best prices and you won’t feel as bad wearing it as a daily. If you are looking to collect, I would recommend a good condition / full set piece. If you are in Hong Kong, I would start with London Watch and Vintage Concept, as they have the largest variety of vintage Rolexes. You can compare the different conditions, and also compare similar timepieces such as the transitional 16750 model. Once you have a baseline, you can go around the various shops around Hong Kong and try to hunt for the exact one you want at the price you are willing to pay.